Earlier this week, it was "hinted" that I should make sure to be at the Guild Meeting tonight. Not that I hadn't planned on going, but things come up and I have missed a guild meeting in my time. However, when the King tells you something "might" happen, you take special care to be there. 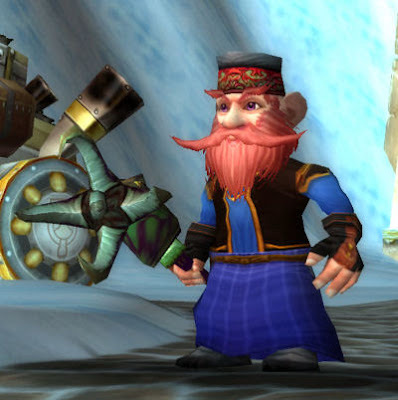 However...two weeks ago we had our dodgeball fight in Stormwind and I came sporting my two usual outfits - one a mix of Tuxedo+Brewfest, the other pure Tuxedo. So for tonight's Guild Meeting, I crafted a new outfit. While I wanted to go with an "oriental" theme to match my new Blade of Vaulted Secrets, I couldn't find any matching clothes and went with something a little more simple, but still fun. It all starts with the Simple Kilt. From there, I needed a blue shirt and the Stylish Blue Shirt fit the bill perfectly. From there, I needed a nice pair of gloves. There weren't really any that fit the bill until I found the Hands of Darkness. They match the shirt perfectly. A pair of Simple Linen Boots cover my feet and I found an interesting hat on the auction house to top it all off - the Slavehandler Cap. There were some other hat options, but I found this one seemed to match the best (couldn't find any wide-brimmed blue hats). For trinkets, I scoured my bank and came up with Thunderbrew's Boot Flask, fire-breathing for the win. And I will have my trusty Timbermaw Guardian by my side thanks to my Defender of the Timbermaw.